Serena Williams was relieved after winning her marathon second-round tie against Vera Dushevina on Monday. (CNN) -- World No. 1 Serena Williams survived the longest match of her career to bounce back from her Rome disappointment and reach the third round of the Madrid Open on Monday. The American was kept on court for almost three and a half hours by the 43rd-ranked Vera Dushevina before prevailing 6-7 (2-7) 7-6 (7-5) 7-6 (7-5) on the clay surface. Williams had beaten the Russian convincingly in straight sets in their past two encounters, the most recent in Sydney in January, but needed to save a match-point at 6-5 down in the second set and also had to battle back from a 4-0 deficit in the deciding tie-break. The 28-year-old was relieved to go through to a tie against either 16th seed Nadia Petrova having squandered a match-point in her semifinal defeat by Jelena Jankovic at the Italian Open on Friday. "I felt really bad about losing last time when I had match-point, so I just wanted to hang in there today," she told the tournament's official Web site. "I feel really proud because I definitely wasn't playing my best tennis -- I was far off from playing well. A match after three hours, at that point it's like, 'I'm not going to lose after three hours, I'd better win.'" 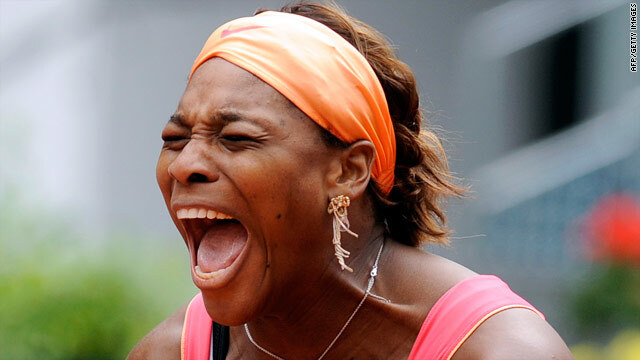 In Monday's other second-round clashes, Serena's fourth-seeded older sister Venus beat Russia's Vera Zvonareva 7-5 6-3. Venus next faces Italian 15th seed Francesca Schiavone, who crushed Austria's Sybille Bammer 6-2 6-1. In the final first-round ties, world No. 2 Caroline Wozniacki crushed qualifier Petra Kvitova 6-4 6-2, while third-ranked Dinara Safina suffered a shock 7-6 7-6 defeat against Czech qualifier Kara Zakopalova. Eighth seed Samantha Stosur beat Argentina's Gisela Dulko 7-6 (7-3) 7-5, and the Australian will face Maria Jose Martinez Sanchez on Tuesday, with the Spaniard having a bye after beating Jankovic in Saturday's Italian Open final. Jankovic will play fellow Serbian Ana Ivanovic in a battle of former world No. 1s after both were given first-round byes. Petrova won her first-round tie against compatriot Elena Vesnina, triumphing 4-6 6-2 6-3, while Chinese 13th seed Li Na beat Spain's Beatriz Garcia Vidagany 6-0 6-2 to set up a clash with Slovakia's Dominika Cibulkova. Italian 14th seed Flavia Pennetta defeated Romania's Sorona Cirstea 6-1 1-6 6-1 to earn a second-round clash with German Andrea Petkovic. But 10th seed Victoria Azarenka of Belarus retired while 3-0 down against Chinese wildcard Shuai Peng, who will now play Israel's Shahar Peer or Russian Alisa Kleybanova.